Putting a successful landing page together requires a touch of art and a little bit of science. That’s because there are certainly accepted principles you can follow, but you also have to be creative, experiment, and put yourself in the mind of a customer who’s looking for more information. 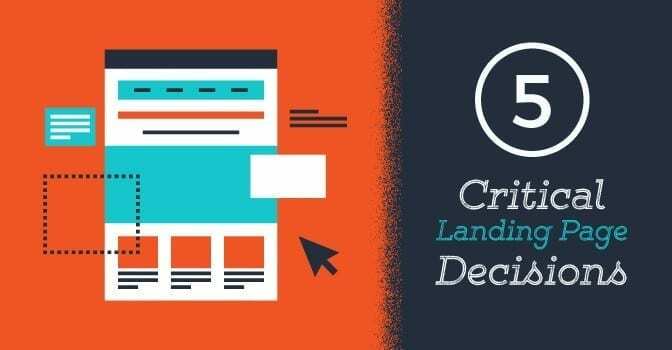 #1: Should Your Landing Page Have Standalone Design? #2: Should Your Landing Page Have Navigation Options? In theory, landing page is constructed to convert visitors into buyers or leads, so any extraneous navigation (for example to your home or about pages) could detract from that goal and confuse potential buyers. On the other hand, your landing page can feel like a “dead-end” if there aren’t options for visitors to keep researching or learn more about your business elsewhere on the site. #3: How Long Should Your Landing Pages Be? The long-standing rule of thumb in Internet marketing is that the higher your price is, the longer your landing pages should be. So, you can get away with a few hundred words for a free e-book, but something that costs several thousand dollars, or more, should be backed by testimonials, guarantees, information guides, and more. Go one page too long, however, and you might lose a visitor’s attention. #4: How Many Conversion Choices Should You Offer on Your Landing Pages? You are probably building your landing page with one specific conversion goal (like a completed sale, or an appointment with a member of your team) in mind. But what about a secondary conversion goal, such as a newsletter subscription? Or, for that matter, what about links to your social profiles? Deciding how many options to give is a balancing act, because each new choice you add increases the odds that a visitor will do something, but decreases the chances that they’ll take the step you are most hoping they will. #5: When Should You Start Testing Your Landing Pages? Continuous testing is important to landing page development. However, you don’t want to start making changes based on incomplete information. One good answer to this conundrum is to always test at least two versions of your landing page, for a set amount of time, and then use the better-performing version as a control that you can test against during the next time period. There are two things that should stand out when reviewing this list. The first is that each of these decisions should be made carefully, ahead of time, and with the advice of a talented and experienced creative team. The second is that there aren’t really many rules that are set in stone when it comes to building a profitable landing page – it’s always good to follow best practices, but don’t be afraid to test different options and see what works for you and your company.